There’s something sophisticated and cool about jazz guitarists that solo and comp for themselves over a tune. 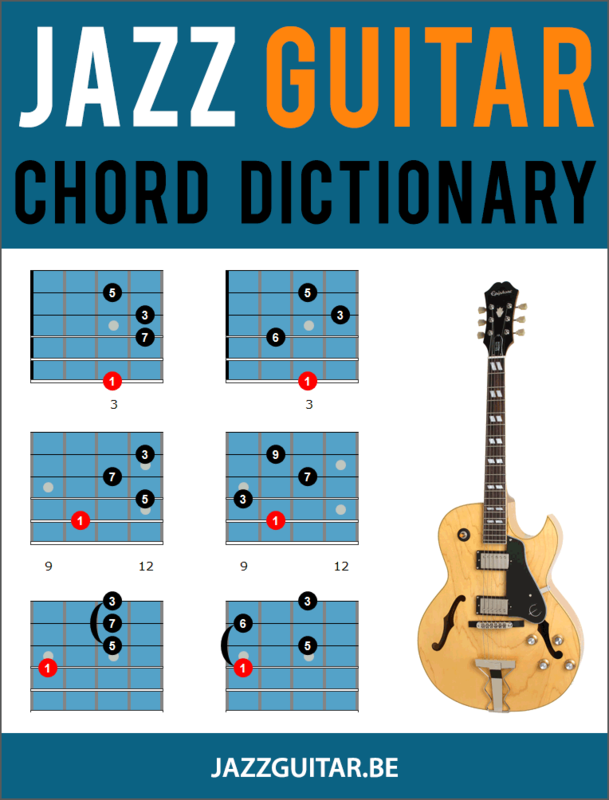 Players such as Jim Hall, Joe Pass, Lenny Breau, and others have made this type of soloing, mixed chords and single notes, a stable of their jazz guitar voice. While you may love those players, and mixed chords-notes soloing, you might not know where to start. In this lesson, you learn about exercises you can work on to develop this side of your jazz guitar improvisational approach. As well, there’s a study over All of Me that you can learn to bring a practical, musical example of this approach into your playing. Before you learn the study below, you can work on creating your own mixed single note and comping solo over this, or any, jazz standard. To work on this concept in your own playing, use the following outline as a progressive way to work the exercise. When soloing, you can use any device you’re studying, such as scales, arpeggios, and licks. As well, you can use any chord voicing that you know, such as drop 2, drop 3, or 4th chords. Here’s the breakdown for working soloing and comping over any jazz standard in your guitar solos. After you work on the study below, or even before if you feel ready, give these exercises a try over All of Me. Then, take these exercises to any jazz standard you know or are studying to take these concepts further in your practice routine. Now that you know how to practice adding comping to your solos, you can learn a study that mixes single notes and chords over All of Me. In this study, you solo for two bars and then comp for two bars, running the form with that formula for a whole chorus. Notice that the single lines start at least an 8th note after the last chord, and end about an 8th note or more before the next chord. This allows you to switch from comping to soloing and back again without tripping up on a fast change. Keep this in mind when working on your own mixed single note and comping solos. Once you have this study under your fingers, you can expand upon this exercise to use it as a stepping-stone in your own playing. Play the chords as written but you make up the single notes. Change the rhythms for the chords but keep notes same. Keep the single notes as written but make up your own chords. Make up your own single notes and chords throughout. Because it’s a long solo (32 bars) start learning it one 4-bar phrase at a time. Learn bars 1-4, then when that’s comfortable, learn bars 5-8. Then, mix bars 1-4 and 5-8 together as you build an 8-bar phrase. Continue through the study this way to make it more manageable to learn and not overwhelming in the practice room. Now that you know how to practice this study, have fun learning it! Hey, you can pay from any country in the world. Just enter your info at checkout and it’ll go through. Great exercise for soloing and comping…thanks! yes!!. it really have made me understand better. I’m wondering if there’s any way to teach and learn about making jazz lines sound jazzy. I can play the lines here, but the emphasis is not right. Yet jazz players can play a dull scale and still make it swing, The eight-note are played with unequal emphasis. I think I once saw a comparison of the different emphasies on the two notes explained mathmatically as 1.4 to one.